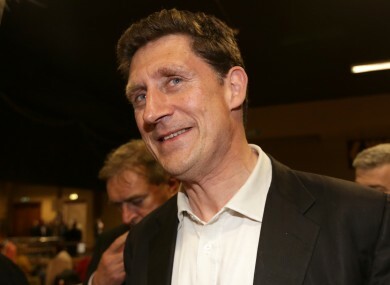 GREEN PARTY LEADER Eamon Ryan is set to contest the next general in the Dublin Bay South constituency. The former communications minister is likely to be selected by the party when he contests its selection convention before the end of the month, TheJournal.ie has learned. Once nominated he will run in the constituency formerly known as Dublin South-East where the last Green Party TD was his predecessor as party leader, John Gormley, who lost his seat in 2011. The decisions brings an end to speculation as to where Ryan would be running for the party at the next election having previously been a TD in Dublin South, now known as Dublin Rathdown. Ryan narrowly missed out on election to the European Parliament last May when he was pipped to the third and final seat in Dublin by Fine Gael’s Brian Hayes. His selection in the four-seat Dublin Bay South would set up a high-profile battle with former Fine Gael minister Lucinda Creighton, who will running under the banner of her new as-yet-unnamed party, as well as junior minister Kevin Humphreys, a Labour TD. Fianna Fáil is likely to run either its legal advisor and local councillor Jim O’Callaghan or barrister Frank Kennedy, who was elected to the council last May. Fianna Fáil’s former TD Chris Andrews, who missed out on re-election in 2011, is likely to contest for Sinn Féin having been elected as a councillor for the party last May. Fine Gael’s incumbent TD Eoghan Murphy will run again and could be joined on the party ticket by highly-rated councillor Kate O’Connell. With Ryan’s move to Dublin Bay South, the Green Party has selected its deputy leader, Dundrum-based councillor Catherine Martin, in the Dublin Rathdown constituency where Ryan was formerly based. Email “Here's where Eamon Ryan is going to run in the general election ”. Feedback on “Here's where Eamon Ryan is going to run in the general election ”.